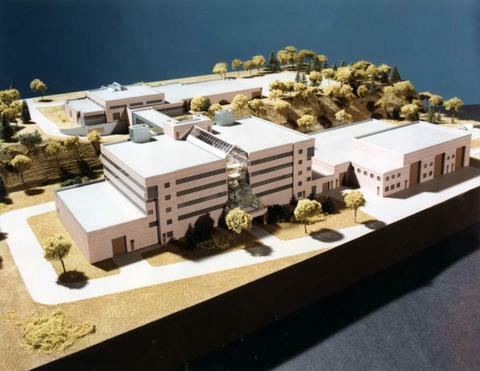 Image of a model for the building. Located near Mont Joli, Quebec, MLI has been the world's leading francophone marine sciences centre since it was established in 1987 by the Department of Fisheries and Oceans (DFO). It is primarily involved in providing the federal government with methods of conserving marine resources, protecting the marine environment, safe marine navigation, as well as research, monitoring and assessment of fisheries, marine mammals, oceanography, and habitats of the Estuary and Gulf of St. Lawrence and Northern Quebec. The Canadian Hydrographic Service at the MLI is responsible for the nautical charts for the region. Also contained within the MLI are the Laurentian Regional Science Branch and the Regional Oceans Branch of the DFO. The MLI takes part in joint projects with the Groupe interuniversitaire de recherches en océanographie du Québec (GIROQ), the Université du Québec à Rimouski, and the Institut maritime du Québec. Handwritten in blue pencil on verso: Maurice Lamontagne Institute/ 37%/ Pers Oct 85. In orange pencil: Oct 85.